From the Flubber Gallery Collection. All photos © TFG, 2008 by Abby Weissman. Snooper TV scene from 1961. 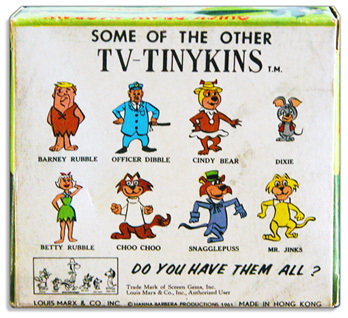 Rear of box showing some of the available figures in the Tinykins series by Marx. This box is one of twelve TV-Tinykins TV Scenes.